When I pass the home of Wayne and Linda Chalmers on the Feeder Canal Road; well actually Regional Road 3, and see the dozens of Canada geese in and around their pond, I recall October 4, 1955, when my father, Maurice, along with some old family friends, Ed, Ralph and Bud Farewell shot five Canada geese in the marsh at Broad Creek. Ed, the father of the Farewell hunting dynasty was known to be a top-flight duck hunter. Dad on the other hand, could handle a shotgun but was at best a weekend-fine-weather hunter. The Farewell boys were off in the deep marsh looking for some ducks from an earlier foray when to the surprise of all, a flock of Canada geese accompanied by a lone Mallard flew over the boat. In six shots from Dad and Ed’s guns, five geese and that lone Mallard began their final flight to the dinner table. Ducks normally do not fly with geese. This fellow paid a high price for hanging around with the wrong crowd. The next day in the Evening Tribune, there was a photo, - likely taken by Murray Hurst, a photo-journalist for the Tribune at the time, and a caption detailing the successes of the great hunters of Broad Creek. In the photo you could see that the Farewells were all decked out with bullet-laden vests. Attached on a cord were the only ones wearing waders. Ed had Bud to do his wading! Dad was obviously not in the same league with his fall coat and pockets filled with shells. No duck-call for Dad. However, Dad did have something the Farewells coveted. He had a Chesapeake Bay retriever named Devil. When Stan Case moved from Port Maitland to Buffalo a few years earlier, he took Devil out to the back of his home and put a shotgun to his head. What would he do with a big mean dog in Buffalo? Dad just happened by and saw what Stan was about to do and called out to him. “Hear! Don’t shoot him! I will take that dog! Stan had always been a bit severe on that mutt and that mutt responded by being a mean tempered beast, never to be trusted by a friend or a foe. However, devil was one of the best duck dogs in the area. They say he would sit quietly in the boat, not moving a muscle until the shooting stopped. Then at the exact moment the hunter was about to give the command to retrieve, Devil hit the water, no matter how cold it was and retrieved every bird brought down. Devil was in the marsh with Bud and Ralph when all the action was taking place on this day! What was the big deal and why the picture in the Evening Tribune? The Canada geese, population had been decimated on Lake Erie by the 1930’s. Not from DDT! From outright savage shooting of anything that moved. My maternal grandfather, Johnny Mullen and his wealthy cronies at the turn of the century had more money and time than they knew what to do with. I recall my grandmother telling stories of how he and his Hamilton hunting buddies would descend on some pre-rented marshes at Long Point strategically placing groups of hunters in a large circle about the marsh, with orders not to shoot until the chief hunter took the first shot. A flock of unsuspecting geese swans or ducks would be called into the centre of the circle and when all were inside the boundaries, the chief would ring out the first shot. All hell would break loose. Each well-heeled hunter with his supply of three to five, five-shot, shot guns and his gun caddy would let loose on the confused and encircled fowl. The caddies were used as one might use a gold-caddy. It was their job to carry the artillery to the hides, and then once the shooting started, they worked feverishly to keep the guns loaded assuring that the great white hunters would always have a ready gun! Grandpa Mullen and his army of hunters soon could not find a Canada goose on Lake Erie to save their lives. Seeing a Canada goose or a swan in the Haldimand area was a rare sight in the 1950’s. I wonder if Ed and Dad would have taken those five geese if they had, had a few minutes to deliberate their plans before the geese so invitingly flew over the boat? The ironies of this story are that Grandpa Mullen would come for Thanksgiving dinner that year and eat his last Canada goose before going on to meet his maker only a few years later. Devil, the mean dog who had become a great family pet would, on New Years Eve day (about 1959) rung one of our cat’s neck after Mom put some goose fat on a dish for the cat. Devil, I suppose, thought the fat was for him! Bud Farewell would, by chance, be visiting that day to do some rabbit hunting in the bush behind our house. With concerns over Devil’s aggressiveness towards a cat he had shared quarters with for some time, led to a fatal decision for the old mutt. Dad would ask Bud to take Devil to the pound in Hamilton where he could be humanely put to sleep. It was an unjust action from my point of view. I prayed and fantasized for years that Bud had not taken Devil to the pound, but found someone to take him in. Recently, while talking with another of Bud’s brothers, Jack Farewell and his wife Fran, of Grimsby, I received the answer to my youthful prayers and fantasies. Bud had indeed taken Devil to a farmer friend where the old mutt lived in happy dog retirement for many more years! 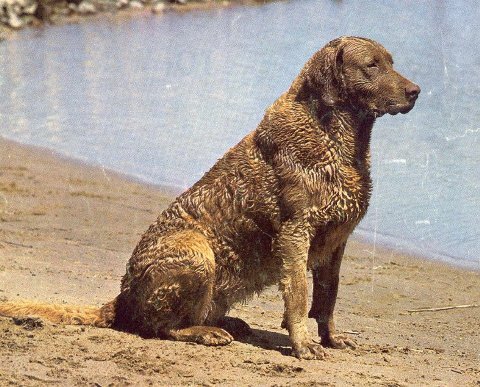 I am unable for find a picture of Devil, but this Chesapeake Bay Retriever photo looks just as I remember him.